If you have a King Song unicycle, you can easily add some shock absorption to it. In that way, the shocks transferred from the bumps of the road to your feet will be partially dampened, which will improve your driving comfort. 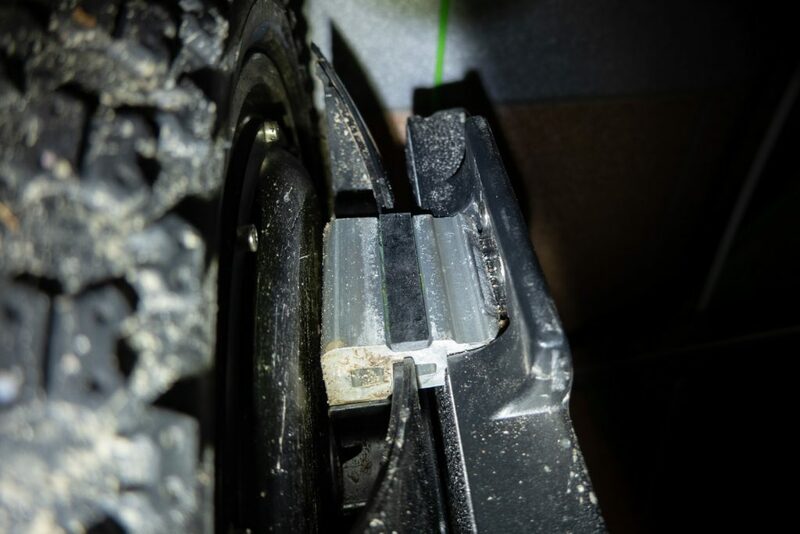 Rubber strip glued into recessed part of the pedal mount (unicycle shown in upside down position). All you need are two rubber strips 11 x 55 mm in size and about 4 mm thick. Glue each strip into the recessed part of each pedal mount as shown in the picture above. Remember to use an adhesive suitable for joining metal and rubber, Loctite 4850 for example. Over time, the rubber may get damaged. In this case just remove old, damaged strips and glue in new ones. Simple, isn’t it? Using slightly thicker rubber strips will increase the dihedral angle. This can be especially useful for people used to riding on Gotway MSuper X.